A retired police inspector on vacation dies suddenly on a train, it sets in motion a whole tangle of intrigue and mystery. If you like mystery and suspense, you will love this classic story. Malter himself opened the door of his small private hotel; a quiet, reserved man who looked like a retired butler. He was the sort of man who is slow of speech, and he had not replied to Mather's guarded inquiry about Mr. Robert Hannaford when a door in the little hall opened, and a girl appeared, who, hearing the inspector's question, immediately came forward as if in answer. Hether recognized this girl. He had seen her only the previous afternoon in Fountain Court, in company with a man whom he knew slightly, Kenth, a fellow-barrister. Kenth, evidently, was doing the honours, showing her round the Temple. Hether, in fact, in passing them, had overheard Kenth telling his companion something of the history of the old houses and courts around them. And the girl had attracted him then. She was a pretty girl, tall, slim, graceful, and in addition to her undoubted charm of face and figure, she looked to have more than an average share of character and intelligence, and was listening to her guide with obvious interest and appreciation. Hether had set her down as being, perhaps, a country cousin of Kenth's, visiting London, maybe, for the first time. Anyhow, in merely passing her and Kenth he had noticed her so closely that he now recognized her at once. He saw, too, that she recognized him. But there was another matter more pressing than that, and she had gone straight to it. "Are these gentlemen asking for my grandfather?" she inquired, coming still nearer and glancing from the hotel proprietor to the two callers. "He's not come in..."
Hether was glad to hear that the dead man was the girl's grandfather. Certainly it was a close relationship, but, after all, not so close as it might have been. And he was conscious that the inspector was relieved, too. "We're asking about Mr. Robert Hannaford," he said. "Is he your grandfather, ex-Superintendent Hannaford, of Sellithwaite? Just so, well, I'm very sorry to bring bad news about him..."
"You'll understand?" he said. "It's, well, the worst news. The fact is..."
"Is my grandfather dead?" interrupted the girl. "If that's it, please say so, I shan't faint, or anything of that sort. But, I want to know!" "I'm sorry to say he is dead," replied Mather. 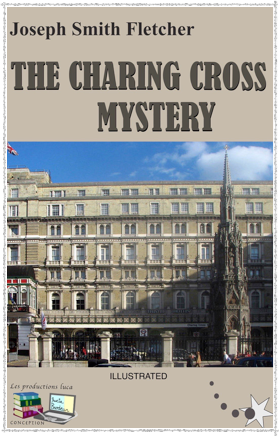 "He died suddenly in the train at Charing Cross. A seizure, no doubt. Was he well when you saw him last?" The girl turned to the hotel proprietor, who was standing by, evidently amazed. "Never saw a gentleman look better or seem better in my life than he did when he went out of that door at half-past six o'clock!" he exclaimed. "Best of health and spirits!" "My grandfather was quite well," said the girl quietly. "I never remember him being anything else but well, he was a very strong, vigorous man. Will you please tell me all about it?" Mather told all about it, turning now and then to Hether for corroboration. In the end he put a question. "This man that Mr. Hether saw in your grandfather's company?" he suggested. "Do you recognize anyone from that description?"